Patterns in men fashion have come a long way as designers continue to include and create more in their canvases. But some patterns, like plaid and check, remain popular since the beginning of the 17th century, and have certain meanings that were socially embedded and continue to do so, some because of the history and/or the popularity of their first users. As fall is here and winter season is coming, plaid and check patterns are back in fashion. We’d like to share some of our knowledge about the popular patterns with all of you. 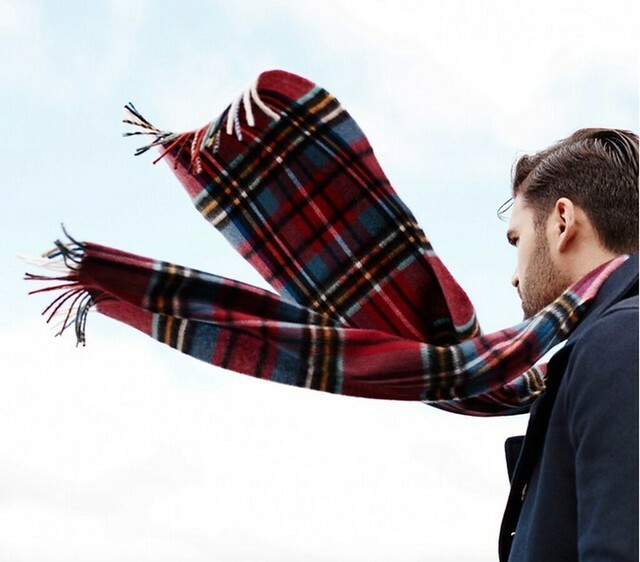 Tartan scarf: Image via Bonobos. Click here to find similar tartan scarf. Want to know our rating for this particular scarf? Click here. 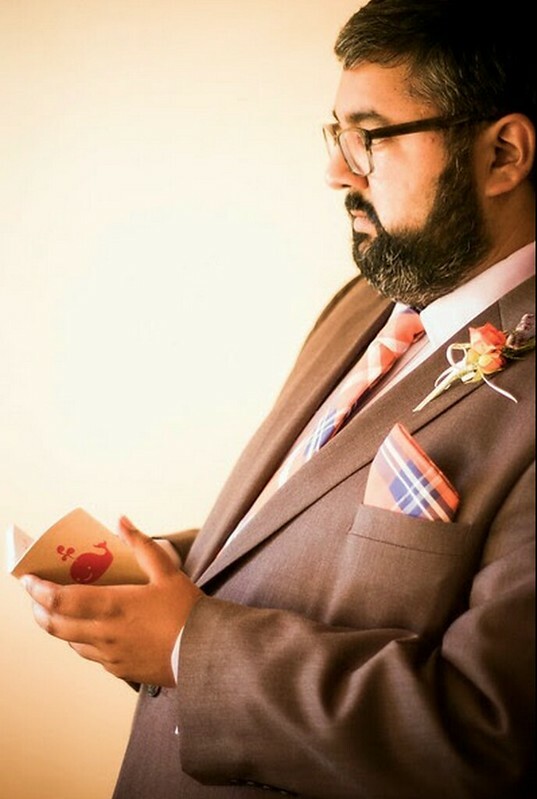 Tartan tie & pocket square: Photographed by Emerson Kim at Z-Phyr Productions. Similar tie & pocket square at Etsy. 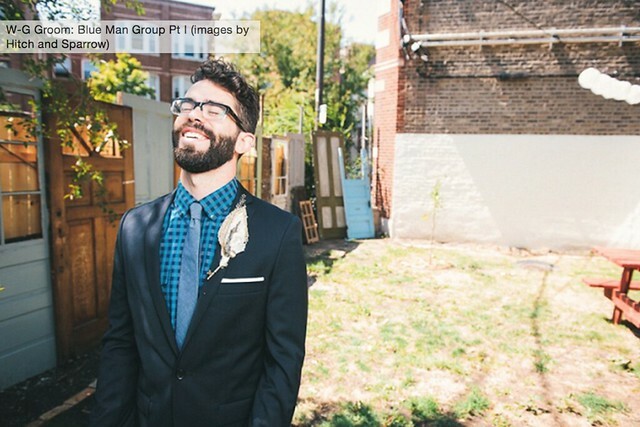 Tartan ties & pocket squares: Photographed by Emerson Kim at Z-Phyr Productions. Find similar ties & pocket squares at Etsy. See more of this Grapetine & Tangerine Twist Wedding. Tartan dates back to 17th century and has its own nationalist history because of its common use in Kilts, which is the national dress of Scotland. Tartan patterns are designed with vertical and horizontal stripes that cross at the right angles to form checks of varying sizes. Tartan patterns are often used in woolen and cashmere fabrics. The most famous tartan pattern in modern fashion world today is the cream-colored base with black, white and red stripes, which was made famous by the English fashion house Burberry. Because tartan is a bold plaid pattern, other than for flannel shirt, tartan should best be used to accentuate your attires or for accessories (such as ties, bow ties and scarves). Tartan wearers are often perceived as classics or traditionalists. Tartan flannel shirt is okay for one of those laid-back, cozy, relaxing kinda day. For a more well-groomed style, use Tartan as an accent (like tie or pocket square or both for a more structured look). Pair it with solid white shirt or solid shirt in the same hue, and solid suit. 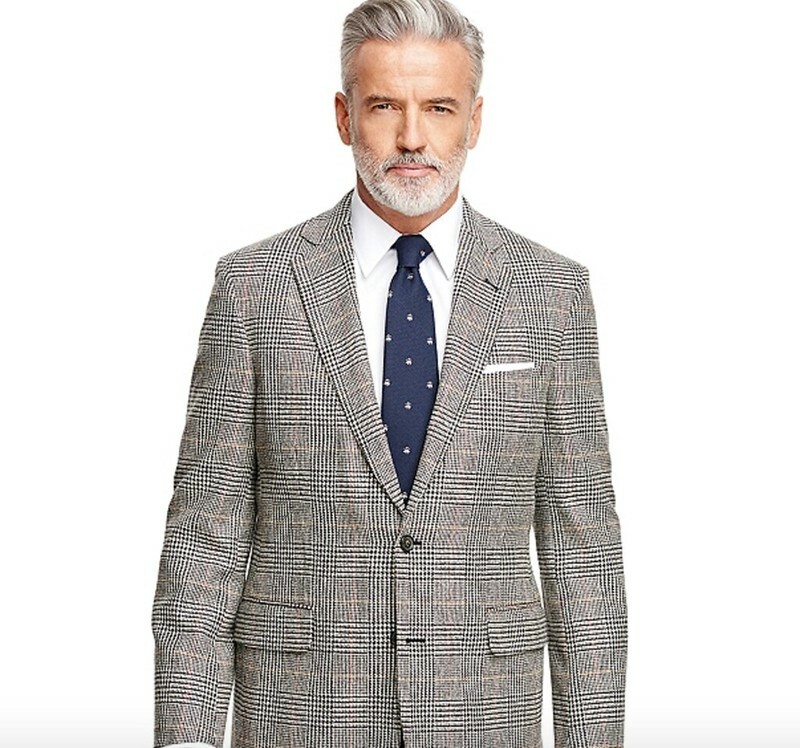 Find similar glen plaid sport coat here. Want to achieve the same look? Get the layering details here. 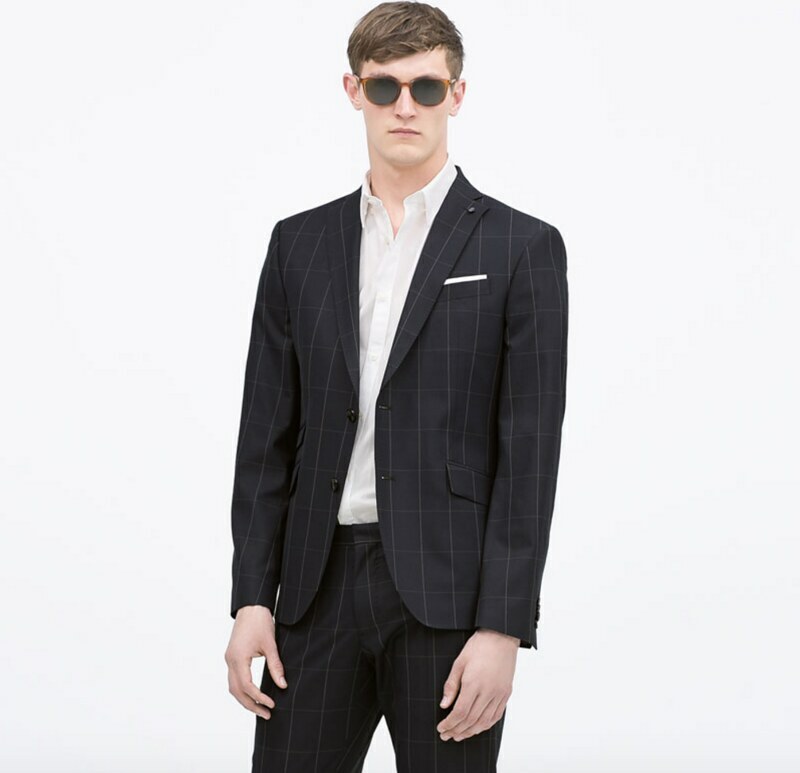 Find similar glen plaid trouser here. Also, see this style snapshot here. Glen Plaid Sport Coat: Brooks Brothers. Glen Plaid pattern got its name from Glenurquhart Valley in Scotland, England. This pattern was popularized by the Duke of Windsor and Prince of Wales, which is why some people also refer too this pattern as The Prince of Wales Plaid. Most commonly found in woolen suits and sports coats, this pattern consists of alternate small and large checks in muted colors, often in grey and white. This pattern have also been favored by Presidents and gentlemen, hence people who wear Glen Plaid often perceived as Important People. To create that Very Important look, Glen Plaid should be the center point. 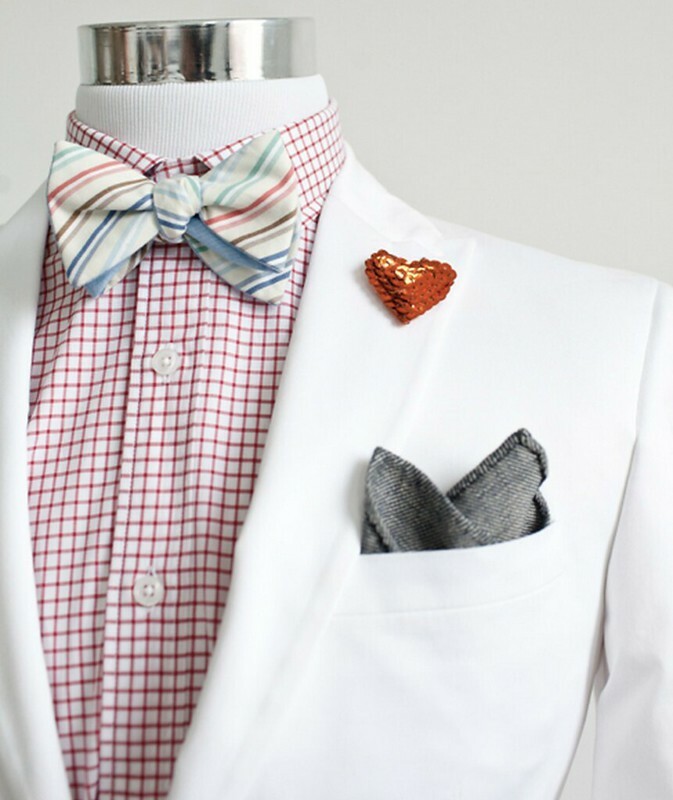 Glen Plaid suit + solid white shirt + tie in the same hue + pocket square. If you need extra warmth, add a solid vest. Add polka-dot patterned scarf within the same hue for that modern twist. Originated in London, England as far back as 18th century, Tattersall usually consist of thin, regularly spaced stripes in contrasting colors like black and red on a base of white, or blue and orange on a white base. 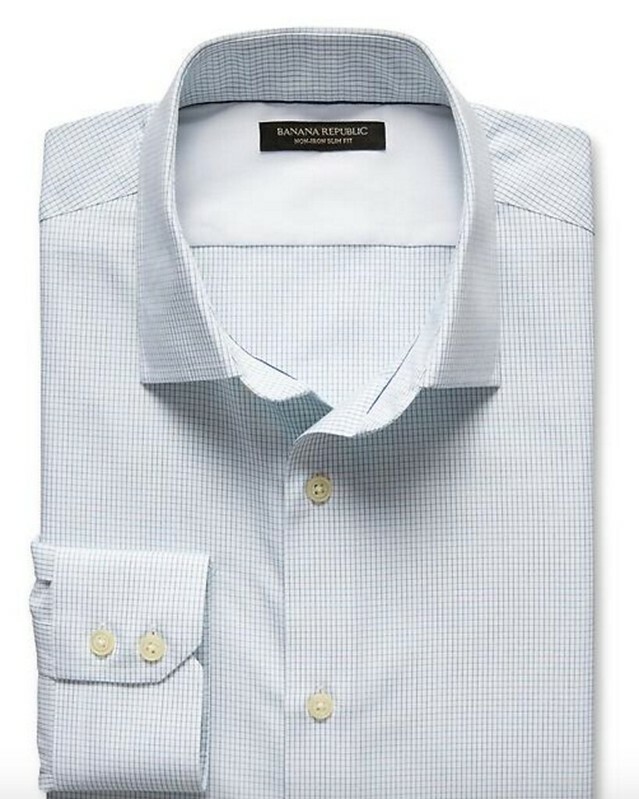 A Tattersall-patterned shirt is very versatile: depending on the color, Tattersall-patterned shirt can be worn as business casual or sophisticated formal attires. People who wear Tattersall-patterned shirt are often perceived as traditional, versatile, and sophisticated. 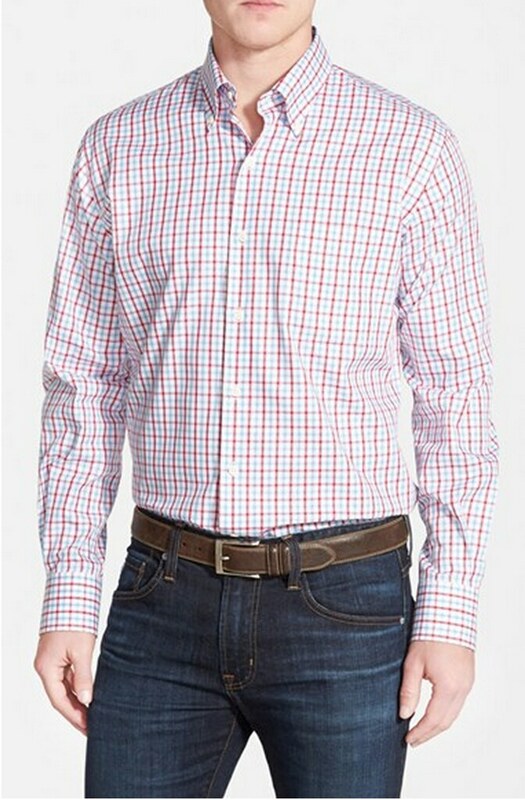 Tattersall shirt paired with Levi’s are uber cool for Casual Friday or weekends. For other days, pair Tattersall shirt with solid trousers. 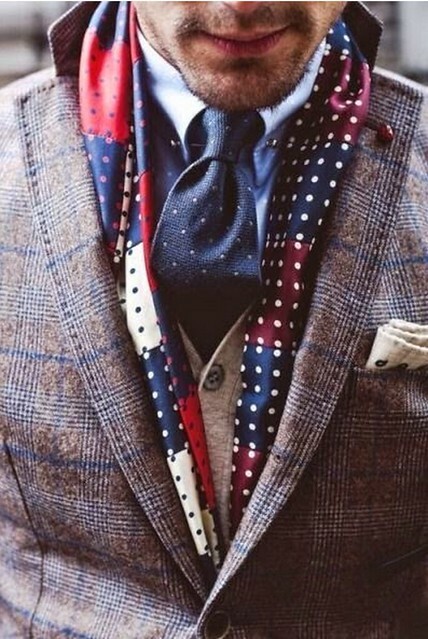 A solid tie and a sport coat in the same hue could also be added for a more gathered look. Find similar graph check shirt here. Get more detail of this cool graph shirt combo look and matching group look here. Click here for DIY sequin heart lapel pin. Graph check is the same pattern like the one you see on graph paper. Similar to Tattersall, only graph check patterns have thin stripes in single or non contrasting color that cross each other and forms even, small-sized checks. 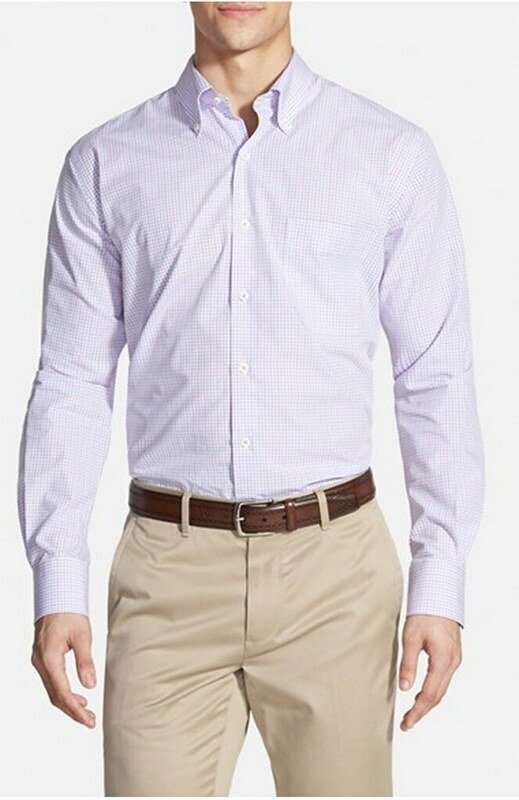 Graph check pattern can create a business casual look, or formal look, depending on the color. 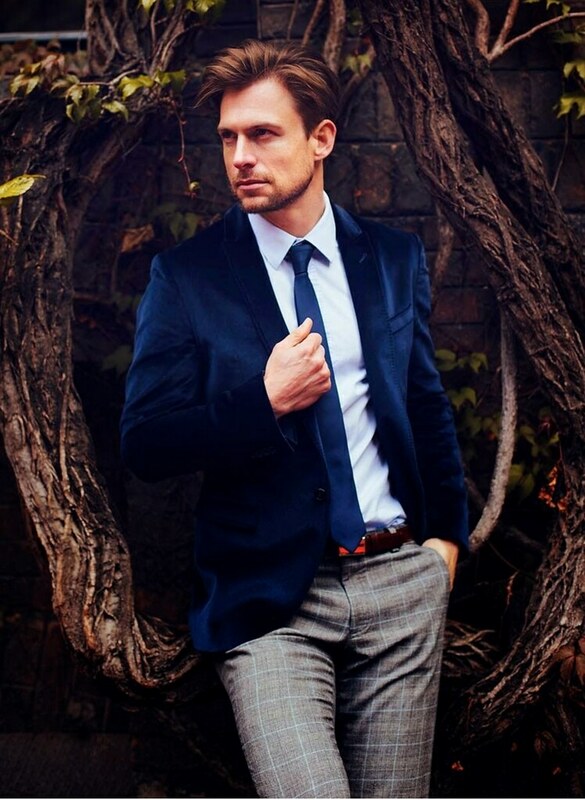 Just like Tattersall, people who wear graph check are perceived as traditional, versatile and sophisticated. Graph shirt in muted color lines is our go to pattern when we are bored with solid white shirt. Wear Graph shirt with a solid suit, and solid tie and pocket square within the same hue for a traditional look. To create a more modern, playful, sophisticated look, try Graph shirt in bright color lines with a solid suit, mismatched patterned bow tie or mismatched patterned pocket square. 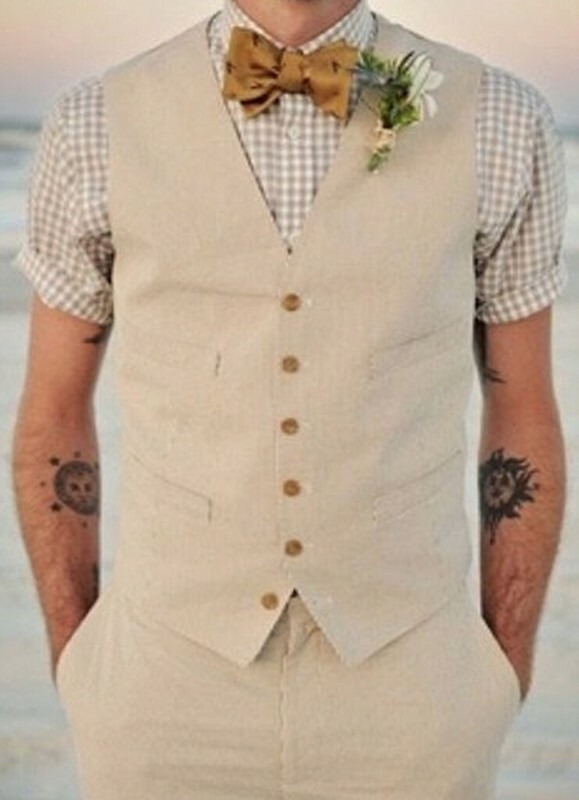 Find similar windowpane vest here. 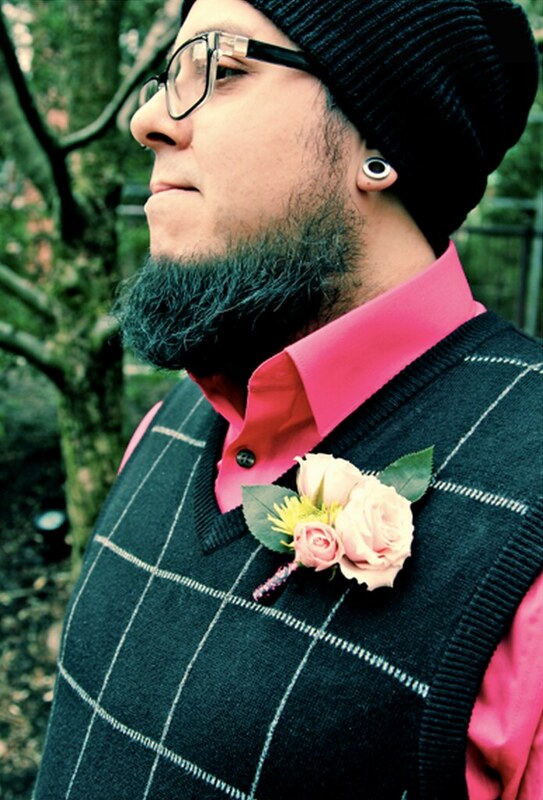 Click to see more of this black and pink combo photo shoot. 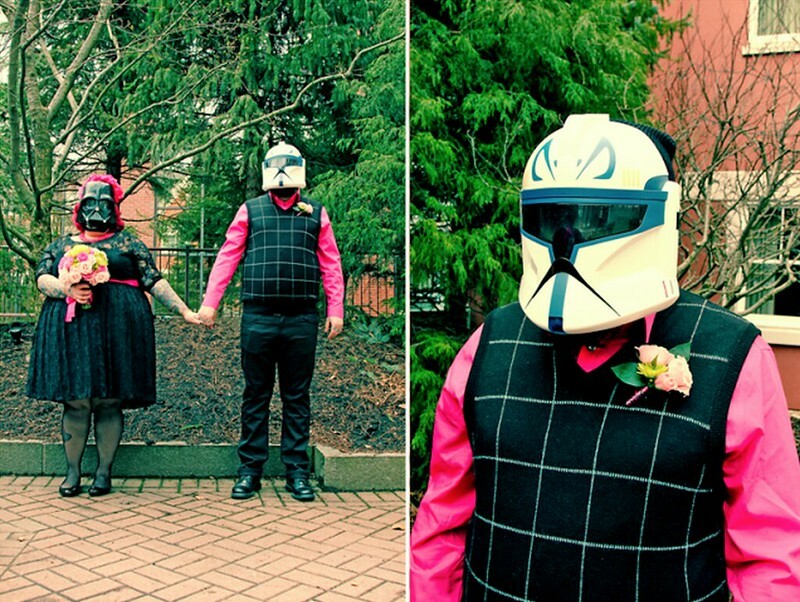 See more of this black and pink, darth vader and stormtrooper themed wedding photo shoot. Windowpane pattern consists of crossing single-colored lines that form wide, evenly sized checks that resemble the panes on a window. Windowpane is quite similar to graph checks: the only difference is that the stripes are often thicker and further apart than used in graph checks. Windowpane pattern is most commonly found in suits and sports coats. People who wear this pattern are often perceived as straightforward and elegant. Windowpane pattern is best paired with solids. White, gray and black usually work well with Windowpane pattern. Other than that, pair it with solids from the same hue. A splash of bright color can be used for a fun twist, although using too much of it may decrease the elegant effect. See this tie and get tips on how to tie salmon herringbone, khaki, and black & white together here. Find similar gingham shirt here. Get more inspiration for short sleeves or rolled up sleeves cool and comfy attires. Find similar blue gingham shirt here. 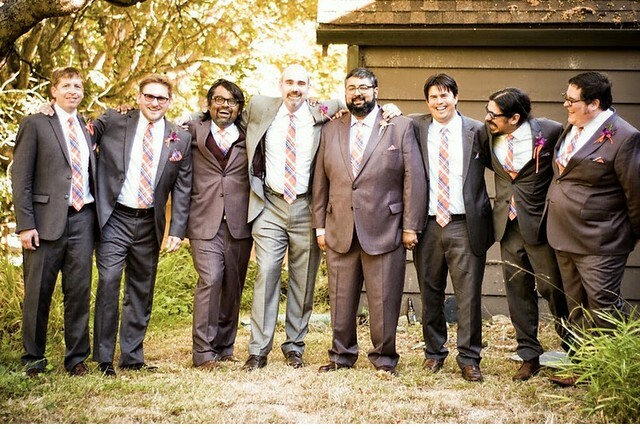 Click to see more of this stylish blue gingham groom and his groomsmen’s ensemble. 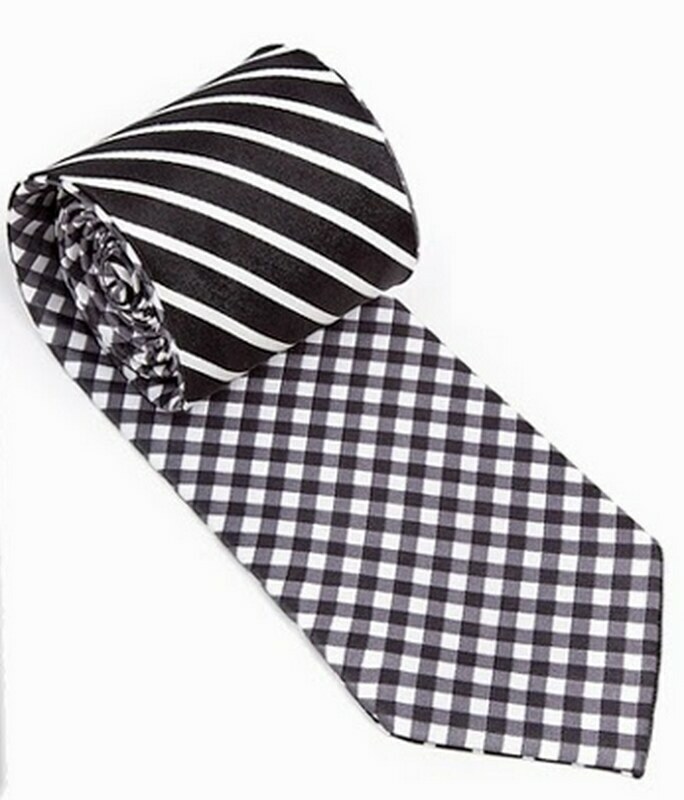 Gingham shirt & tie: Ben Sherman. 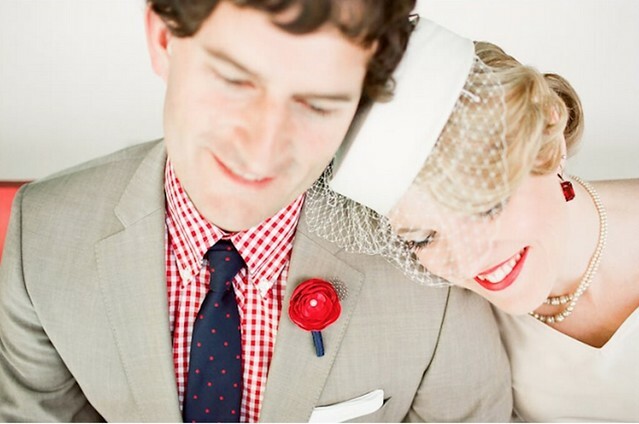 Get more ideas for a red, white and blue, patriotic themed wedding. 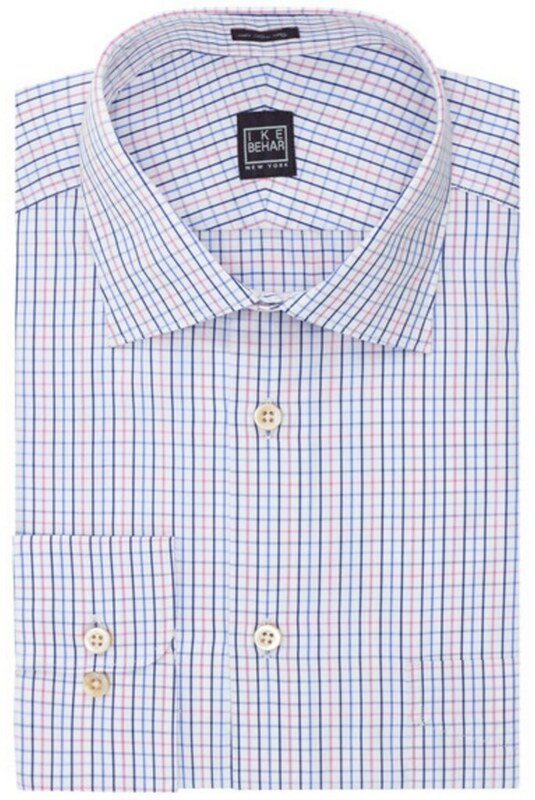 Originated sometimes in mid 18th century in Manchester, England, gingham is a very popular menswear pattern that is mostly used for dress shirts. Consisting of broad single-color bold and tight square checks on a certain background (usually white), gingham also commonly used for tablecloth. People who wear gingham are often perceived as casual, fun, and don’t take themselves too seriously. 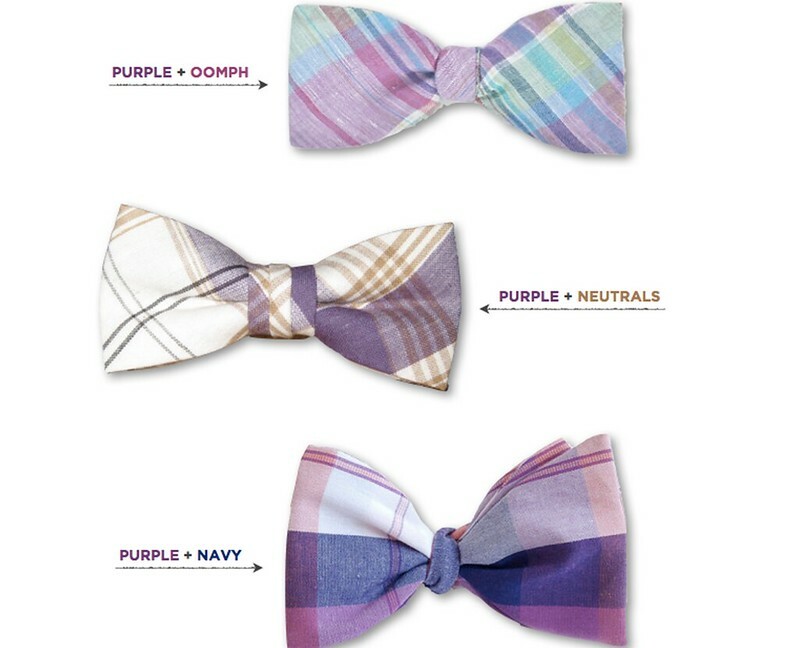 Click here to get ideas on how to coordinate purple madras bow tie in your attire. 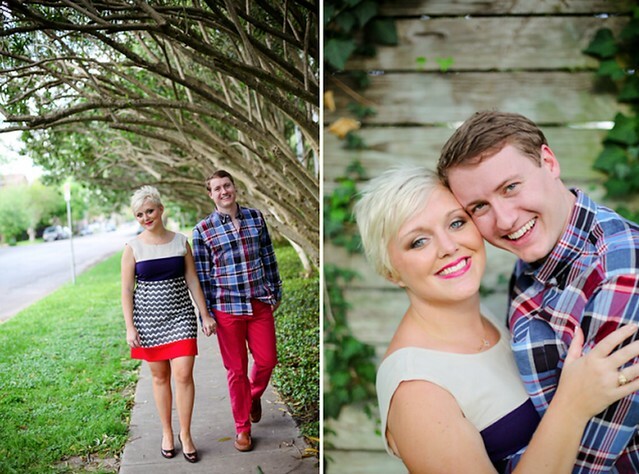 See more of this madras shirt and the patriotic themed engagement photo shoot here. Originated in the 19th century, Madras got its name from the original name of a city in India that is now known as Chennai. This vibrant pattern consists of colorful lines that cross to form uneven checks. Madras patterns are most commonly found on lightweight cotton fabric worn in summer or in warm climates. As a pattern that is very bright and casual, madras patterns are seldom be found in business attire. However, this pattern is commonly used on shorts, chinos, golf apparel, casual shirts, and accessories. Madras is a preppy staple that screams: Bold. Bright. Carefree. Madras IS a casual pattern. To up it a tad notch, madras shirt can be paired with a suit, or with a solid sport coat and solid trousers within the same hue. …Now that you know the 7 popular patterns, which one best describes you? 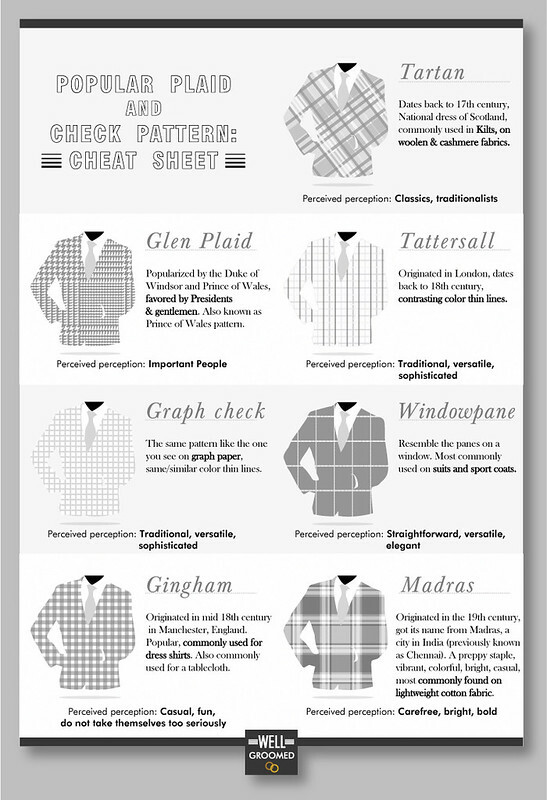 To make it easier to navigate the world of plaid, here’s a cheat sheet for you!